Since cats tend to outweigh rats, it might seem as if they're (sorry in advance for this) the cat's pajamas at controlling rodent populations, but that's not quite the case. Sure, cats may occasionally bring home gifts of dubious appeal to their owners, but they're not really effective at keeping rat infestations under control since rats breed so rapidly and tend to escape to confined spaces that cats can't access. 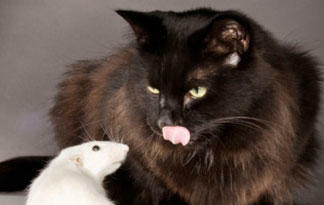 Healthy adult rats are also often too big for cats to manageably oppose, and cats' interest in and ability to hunt varies greatly depending on the individual. Plus, there's a related downside to having pets if you want to control rodents populations: If you leave their food and water dishes out, your home could be attracting more rats than it would have been in the first place.